Defense Minister visits Binyamin, emphasizes that the settlement enterprise in Judea and Samaria is crucial to Israel’s security. 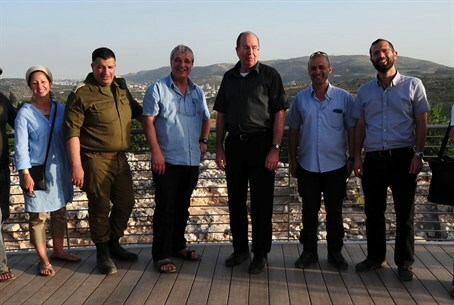 Defense Minister Moshe Ya’alon on Tuesday visited the Mateh Binyamin Regional Council, where he said that the settlement enterprise in Judea and Samaria was crucial to Israel’s security. Ya’alon praised the local leaders for “taking social and national tasks upon themselves. I am happy to see the leadership in the Binyamin region taking responsibility and being involved in educational and social activities." Avi Ro’eh, head of the Binyamin Region Local Council, thanked Ya’alon for his visit and his words. “We welcome the opportunity to host the Minister of Defense. Many challenges stand in the face of the settlement enterprise, and the Ministry of Defense has been working in close partnership with us over the years. We are hopeful that we will continue to work together to promote the settlement enterprise,” he said.